CUSTOM HOUSE, 60 RAJAJI SALAI, CHENNAI – 600 001. 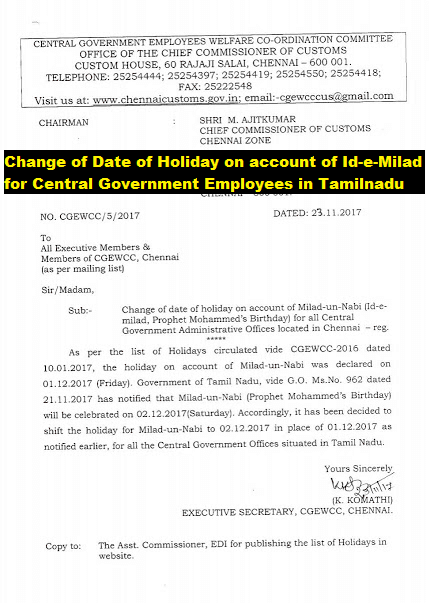 Sub: Change of date of a holiday on account of Milad-un-Nabi (Id-e-Milad, Prophet Mohammed’s Birthday for all Central Government Administrative Offices located in Chennai – reg. As per the list of Holidays circulated vide CGEWCE-2016 DATED 10.01.2017, the holiday on account of Milad-un-Nabi was declared on 01.12.2017 (Friday). The government of Tamil Nadu, vide G.O. Ms.No.962 dated 21.11.2017 has notified that Milad-Un-Nabi (Prophet Mohammed’s Birthday) will be celebrated on 02.12.2017 (Saturday). Accordingly, it has been decided to shift the holiday for Milad-Un-Nabi to 02.12.2017 in the place of 01.12.2017 as notified earlier, for all the Central Government Offices situated in Tamil Nadu. The government of Tamil Nadu, vide G.O. Ms.No.962 dated 21.11.2017 has notified that Milad-Un-Nabi (Prophet Mohammed’s Birthday) will be celebrated on 02.12.2017 (Saturday).